Salon International is the destination for the professional hairdressing industry and this year the exhibition enjoyed a tremendously successful year at London Excel from 13th – 15th October. 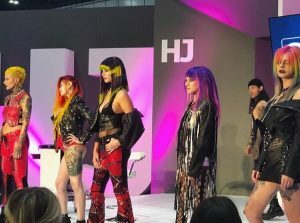 Professional Beauty Systems showcased their two flagship hair brands, OSMO and Crazy Color which each wowed the crowds with their showstopping stands and stage presence. Visitors to the stand were invited to watch one of the many shows on stage and discover more about the brand and its expertise. Giving the presence of salon owners, hairstylists, and experts in the industry, the event was also an opportunity to introduce two new product launches, Colour Revive range and Super Silver No Yellow Mask. 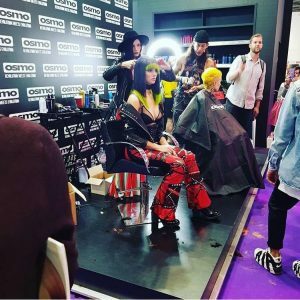 The atmosphere around the stand was always energetic: aside from the offers in the retail area, the stage offered a busy line up of shows by OSMO ambassadors who entertained the crowd with their skills. Colour demonstrations, styling, cutting, and shading: the ambassadors demonstrated techniques from hairstyling to barbering, incorporating the OSMO products. The line-up included the award-winning barber Tom Baxter, the young and creative Heffy and Jes from HX Hair, the hairdressing gurus Luis Chevere and Kristen Michelle from Texas, USA, the new OSMO ambassadors Cal Newsome and many more, compared by renowned barber Myles Lewis. The OSMO ambassadors also had dedicated time on the event’s official stages: HJ Men stage, HJ Stage and with the Choose Hair stage. Global colour brand Crazy Color® returned to Salon International for a weekend of bright creativity, fun, education and networking. 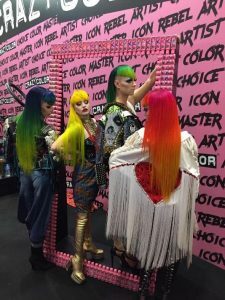 For four decades the brand has been at the forefront of hair colour, constantly evolving and setting trends and this year they created a bright neon stand to promote the launch of their popular GO NEON range and Pastel Sprays – it was the go-to stand for all things colour. With a fantastic retail area showcasing every Crazy Color® under the sun, as well as a stage space for ambassadors to promote the brand and show-off their creativity, including two new product launches from this year, the Crazy Color® GO NEON and Crazy Color® Pastel Sprays in Bubblegum, Lavender, Marshmallow, Peachy Coral and Graphite. A colourful selfie area made from the iconic pink Crazy Color® bottles, encouraged visitors to the stand to play around with new products and shout about Crazy Color® across social media. With a real buzz surrounding the stand, the stage offered inspiring looks from an incredible line up by Crazy Color® ambassadors, including Sophia Hilton and the team at Not Another Salon, Joel McCauley from Slunks in Cardiff and Patrick Marrow from Hive in Manchester; from bright neon hair to unicorn balayage – the ambassadors really honed in on the newly launch products and gave a real insight into the stunning results that can be achieved.